She perches gracefully on the charging animal. 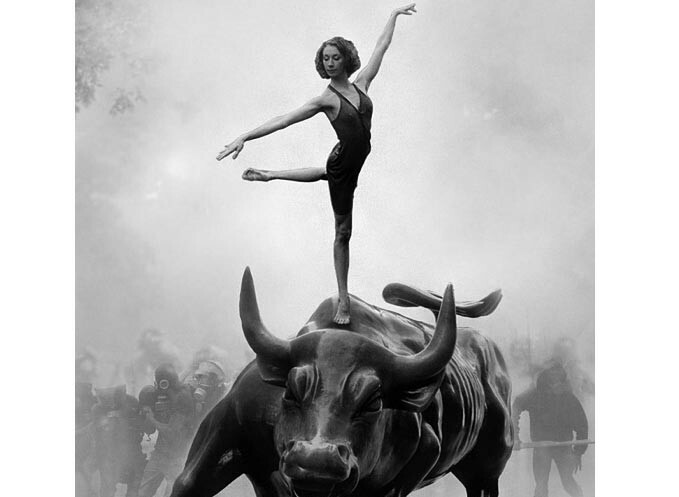 Poised atop the bull, which is an iconic—and possibly ironic—symbol of aggressive financial optimism and prosperity, the ballerina extends her arms, her leg, serenely posed against the grey skies. But they are not alone on Wall Street. In the fog behind the bronzed beast, a crowd emerges wearing gas masks and holding batons, arms linked together against whatever is ahead. The poster is scenic, striking and, as the events over the last four weeks have revealed, perhaps even revolutionary. Setting this movement in motion was the Vancouver-based Adbusters magazine, which created the image in July. It’s part of the publication’s long history of using visceral, often shocking images to inspire readers, but this one in particular has since taken off, becoming an emblem of the Occupy Wall Street movement, igniting something powerful in the public imagination that has held fast. Calling itself a “revolutionary magazine with a revolutionary agenda,” Adbusters has been advocating for a cultural insurgence against consumerism and corporate forces controlling Western culture for the last 20 years. While they may have been the first to launch the idea to occupy Wall Street with this beautiful image, “It’s the people who are in New York City, and now all over the nation who ran with it and are making it what it is,” explained Adbusters Senior Editor Micah White in an interview with The Link. Following the OWS events closely, White is convinced this movement is just the beginning; that something big is in the air. The New York Police Department has fenced off the Wall Street bull from the thousands of occupiers, with security personnel guarding it 24/7. Taking Wall Street—a place of huge symbolic importance—and holding an assembly to reassert a people’s democracy, OWS combines elements of the Egyptian Tahrir Square occupation that was a crucial component of the Arab Spring with the acampadas resistance model that proliferated in Spain last May. The movement isn’t without its critics, however. Mainstream media outlets were reluctant to even report on the OWS in its early stages, and have since derided it as nothing more than a fringe group, with disparate demands, that will eventually fizzle out. White doesn’t share that pessimism. As for OWS’s detractors, White was frank: “I would say to them that they need to wake up and look around at the world—we’re in an end-time moment,” he said. “There’s financial collapse, ecological collapse, there’s moral collapse and mental collapse. White believes that escalating the spirit of OWS and its call for a people’s democracy onto an international platform is the next step, along with demanding solutions to governance and financial crises. He added that a deepening concern for the future could be felt worldwide. For their part, Adbusters has endorsed calling for a “Robin Hood” or “Tobin Tax” on all global financial transactions at the upcoming G20 Summit in Cannes, France on Nov. 3 and 4. The proposed one per cent tax on all financial transactions is intended to increase the contribution of financial services to failing social structures and limit market volatility, earmarking funds raised for poverty reduction and other public programs. The primary point is to “slow down fast money,” while also giving people the power to participate and make demands on the future of the global economy. To get people behind any movement, however, requires creative thinking to engage people to work towards solutions to challenges ahead, said White—be it reforming the government of the United States or confronting the Quebec government about tuition increases. This article originally appeared in The Link Volume 32, Issue 07, published October 11, 2011.